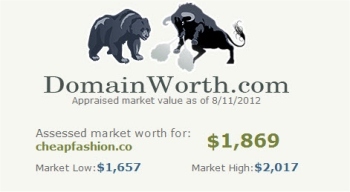 Domains International (Blog) | Domains Marketplace: CheapFashion.co is for sale! The domain CheapFashion.co is for sale. This is a name very useful for those who needs to create a web site on fashion (but cheap) like designers, stylists, fashion models and other related with Fashion Business. The domain can be visited at http://www.cheapfashion.co but the appraisal certification by DomainsWorth.com is included on the image above. You have three values, the low one and the highest when the market is high. However you can get it around $1000 or a little less, if you decide faster as you can. The payment is by PayPal and we ll give you my account details after your email to domainshouse@gmail.com.